Building a new home? Remodeling the kitchen or bath you have? Create the kitchen or bath of your dreams with the help of the knowledgeable crew at Benson Lumber. You will work with our professionally trained kitchen designers who will help you every step of the way. Choose from an array of cabinet finishes from cherry to oak. 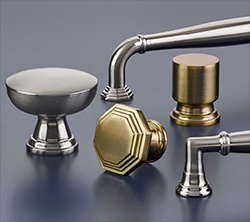 Put the finishing touches on your kitchen or bath with beautiful hardware and fixtures that add fashion and function. And to make it easy, we have a professional installation team so you don’t have to lift a finger. We can handle as much, or as little, of your project as you would like including plumbing, electrical work and drywall. GET READY TO GET INSPIRED! Interested in FLOORING for your new Kitchen and Bath? Click HERE!